There are myriad of ways to create a Linux Live/installation USB drive, but one of the best ways that I recommend is by using the Rufus utility. It is a free tool that has been around for several years and makes a reliable installation USB. I have personally tried and tested this on Windows 10. Step 1: Get an empty USB drive of at least 2 GB, but I don’t recommend not more than 8 GB because not all PCs can boot through USB drives of more than 8 GB capacity. Step 2: Download Rufus utility for Windows. It is a free portable utility and so doesn’t need installation. Step 3: Download the latest version of Linux Mint from their website. Again, this is also 100% free operating system. The downloaded file will be in ISO format. As of today, they have Linux Mint 17.3 Cinnamon edition. You can grab the 64-bit edition for best performance. Step 4: Right-click on the downloaded Rufus program and select ‘Run as Administrator’. Click on the CD drive icon near the checkbox ‘Create a bootable disk using ISO Image’ and select the Linux Mint ISO file that you downloaded, for example, mine says linuxmint-17.3-cinnamon-64bit.iso. 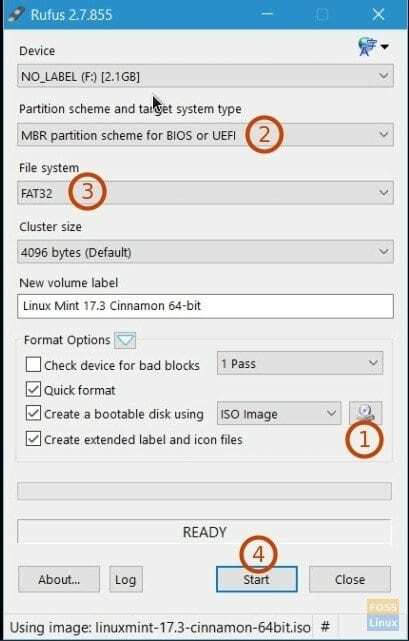 In the same interface, click on drop-down list under ‘Partition scheme and target system type’, select ‘MBR partition scheme for BIOS or UEFI’. Next select file system as ‘FAT32’ and finally click ‘Start’. Step 6: Keep the ISO Image mode to write when prompted and click OK. Step 7: Wait until Rufus writes the data to the USB flash drive. At the end of the process, you should see the structure similar to mine. That’s it. Your Linux Mint Live USB / Installation is ready! unfortunately it does not work. the 4GB USB stick is not recognised. I get a message please insert appropriate media and reboot. No luck here. The Sandisk 4GB USB stick is simply ignored. No luck here. The USB stick is simply ignored. Thank you! I never though creating a live usb can be so simple. I used a Sandisk 16 gb USB to create Live USB. your steps were easy to follow and result was perfect. Worked perfectly with 2Gb stick. Thanks!